Just got back from a hike into Blue Mesa. There is a nice 1-mile path into the canyon that winds around the clay and sandstone hills, which really do look blue in the morning light. It’s gotten windy with clouds moving across the sun at times, and rain on the way later today. 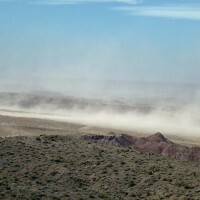 On the drive back to the apartment, I saw billowing dust in the distance and stopped at one of the overlooks to see a narrow cloud of dust stirred up from a dry wash. Quite a sight – like a wall of dust. I can hear the wind now – they say up to 50 mph gusts. 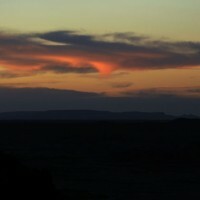 Went to the Petrified Desert Inn for sunset last night. It’s a National Historic Landmark built in the 1920s of petrified wood and native stone, and renovated in the Pueblo Revival style by the Civilian Conservation Corps in the ‘30s. Originally it was an inn and restaurant for tourists; now it’s a museum. There are six small rooms where guests used to stay. They are tiny, just enough room for a double bed and a small dresser and a sink. Each door exits to the outside; to use the bathrooms, you would have to go outside and back into the main entrance, then down a hall. 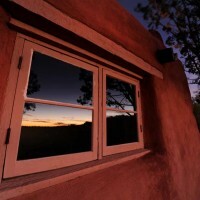 I saw the post-sunset sky reflected in one of the windows. The variety of cloud formations is endless – one last evening looked like a UFO in the distance.